Deep conditioners are very essential to keep your natural hair as healthy as possible. Otherwise your hair will become dry, frizzy and coarse. It is very important to keep your natural hair strong, curly, and hydrated as it is very common that naturally black or curly hair will lose its moisture due to humidity or hot environment. Only the best deep conditioners for natural hair can restore the moisture, shinning and can prevent the hair breakage and damage by enhancing the natural curls by the help of its ingredients. Some of the ingredients in deep conditioners such coconut oil and aloe Vera will increase the strength of hair roots preventing from hair fall. A good quality deep conditioner should work perfectly in repairing your hair from any damage and make the hair strong and increase the shine and protect your natural hair from damaging. What you really need is a deep conditioner for natural hair, which will help in balancing the pH level in your hair and at the same time smooth that cuticles. A good conditioner will not only help in creating the right moisture balance but also enable preservation and locking of hair color. If your hair has smooth cuticles then it will look healthier, shine more, and will definitely have a better bounce and body. We have looked at the top deep conditioners available in the market and chosen only the TOP 10 best deep conditioners for natural hair that contains essential nutrients to enhance shine and increase the curls. 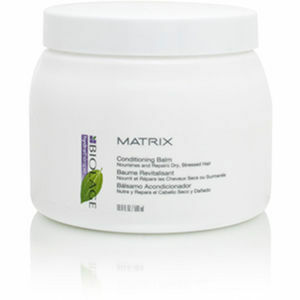 The first deep conditioner for natural hair that is a must have is Matrix Biolage conditioning balm as it made using natural ingredients like aloe Vera and algae, which will help in replenishing your hair with moisture. This product has been created specifically keeping in mind the wild and arid climatic conditions as well as multi-tonal hair styles including naturally faded browns, sunburnt copper-golds, and dusted blondes. Using Matrix Biolage Balm as a deep conditioner every alternate week by leaving it on for 10 mins and a final rinse with cold water gives smooth, shiny and manageable hair for someone who has thick frizzy hair. Regular usage of this Conditioner make your hair hassle free throughout the week. Doesn't contain harmful chemicals including sulphates, silicones, parabens as well as artificial colorants. Era Organics deep conditioner nourishes the natural hair and scalp with organic Aloe Vera, Manuka Honey and Argan Oil to restore dry, brittle or oily hair. It Soothes, Moisturizes and Repairs Your Dry, Itchy Scalp and transforms your dry, frizzy hair into soft, manageable locks. This deep conditioner is sulfate free natural conditioner with PH balanced and rich in vitamins to help repairing dandruff, scalp psoriasis, eczema and more. 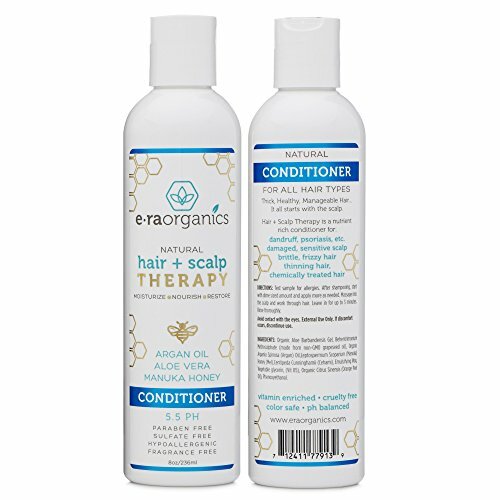 Era organics is a natural hair care deep conditioning product with no alcohol, SLS, silicon, paraben free, animal cruelty-free and fragrance free. It Uses nature’s best deep conditioning ingredients to increase hair volume, hair strength and shine in just under 3 minutes. It contains a natural conditioner treatment formulated to boost hair regrowth and halt hair loss which stimulates to Improve circulation, collagen & keratin production - Leaves hair softer, shinier and more manageable to help it grow. This is the best detangling product for all hair types Argan Oil Conditioner for Dry, Itchy Scalp & Dry, Damaged, and Frizzy Hair that includes chemically treated hair and color safe. Can be used for different types of hair including oily hair, dry hair, and color treated hair. 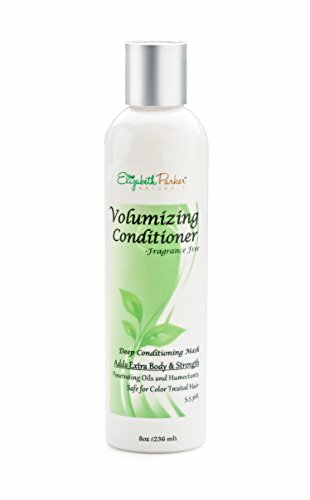 Elizabeth Parker Naturals is not just a deep conditioner for natural hair but also a Deep Conditioning Treatment & Hair Thickener which Promotes Hair Growth and Prevents Hair Loss. The Conditioner is filled with moisture magnets called humectants for making the hair very soft, shiny and manageable from dry and frizzy hair. This product is free from Sulfates, Parabens, Mineral Oil, Fragrances, Dyes, Gluten Free or other harmful ingredients. It is a vegan friendly deep conditioner draws moisture and leaves your hair soft and manageable. Besides conditioning it volumizes your hair, cleanses & Prevents oily hair and removes the buildup from scalp. A true color safe conditioner for the natural hair. Contains natural ingredients including Organic Aloe vera, Citrus Sinensis Peel Oil, Manihot Esculenta (Tapioca), and Manuka myrtle. Not only clean and moisturize hair but also leave them soft and manageable. VIRGIN HAIR FERTILIZER is often referred as African Hair Fertilizer that treats and restores weak, dry damaged, brittle and dry hair to leave the hair looking smooth and healthy. It is an ideal deep conditioner for African American hair types to restore dry and damaged that may have suffered years of plaiting, heat or chemical treatments. 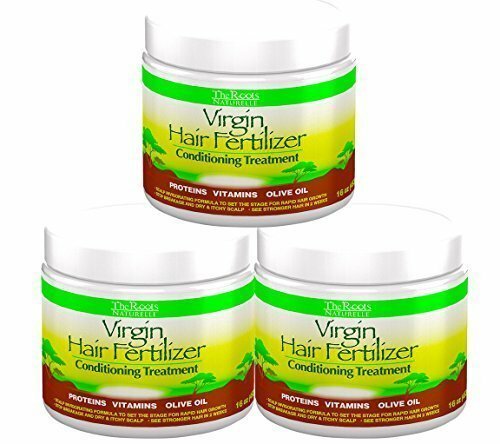 Virgin Hair Fertilizer is a natural hair product which contains ingredients including proteins, vitamins for hair growth, olive oil, shea butter, peppermint oil and sweet almond oil that strengthen hair and reduce breakage. It makes the hair styling extremely easier and leaves hair looking soft, healthy and invigorated that leaves as a favorite conditioner for hair stylists. Virgin Hair Fertilizer is an ultimate Hair conditioner for damaged hair which contains nutrients, vitamins and proteins that combine to promote hair regrowth for women and men and provide an essential deep conditioning treatment for your hair. This conditioner can be applied to curly hair, weaves, and thinning hair or for people who are worried about hair loss and it is Safe to use on colored hair. Contains natural ingredients like Tea Tree oil and Peppermint oil, which not only promotes growth but also helps prevent dandruff. Most ideal for African American hair type or black hair that has a lot of curls. The Pureology anti-fade complex hydrate condition is not just another deep conditioner for natural hair but a complete hair solution. It enables gentle cleansing and moisturizing of your hair and at the same time also protects hair color vibrancy. The product has been created to ensure fine color-treated hair can be replenished and detangled with ease. Pureology hydrate conditioner comes with potent antioxidants and sunscreens that Moisturizes, detangles, and locks in color. The Pureology anti-fade complex hydrate condition has been created using natural ingredients like organic peppermint, sage, and rosemary botanicals and provides intense hydration without weighing your hair down. "Anti-Fade Complex" technology helps in maximizing color retention. 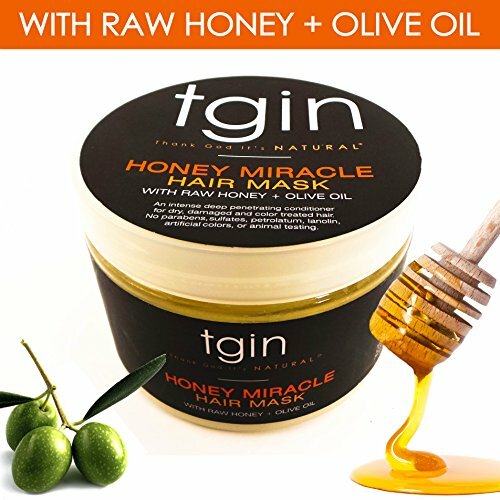 Tgin Honey miracle deep conditioner can do miracle by bringing your natural hair back to life and manageable with its miracle treatment on hair. The Raw Honey ingredient moisturizes you hair and makes it soft and shiny. The other ingredients such as olive and jojoba oils provides the vitamins A, E and D required to nourish and heal your damaged natural hair and also, reduces hair breakage and shedding. This deep conditioner helps in reducing the hair breakage and helps to maintain the hair length. It keeps your hair from becoming frizzy by smoothing your hair cuticle and adds softness & shinning naturally. This conditioner is highly recommended for people who want to get rid of thick frizzy curling hair. Hairgurt Deep Conditioner Masque is made with Yogurt Powder, Prebiotics, Quinoa, Our Botanical Oil Blend and Prolipid specifically formulated to help improve bounce, manageability and curl elasticity. 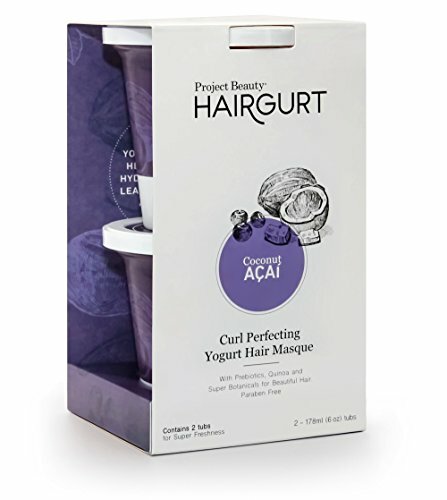 Hairgurt Curl enhancing deep Conditioning Yogurt Masque is Sulfate Free and Paraben Free and loaded with healthy hair ingredients and a balanced blend of six botanical oils to feed and nourish your dry, damaged hair. It contains Hazel Seed Oil which is high in Vitamin E and essential fatty acids which provides the fine texture to your hair and allows it to be absorbed quickly and penetrate deeply into dry hair. Another ingredient Sweet Almond Oil’s that has high amounts of Vitamin E and fatty acids and is responsible for naturally hold the moisture in for longer periods of time and helps add shine to dull, dry hair. Macadamia Seed Oil’s omega-6 and omega-3 fatty acids helps improve strength and elasticity of hair. The Mango Seed Oil with lot of vitamins, minerals and antioxidants helps to repair the dry damaged hair. Pomegranate Oil ingredient in hairgurt conditioner gives the power of the antioxidant Vitamin C that helps to fight against those free radicals is one shot. Pomegranate oil is also rich in punicic acid that helps to revitalize dry hair. Raspberry Seed Oil - High in omega-3 fatty acids and antioxidants helps to strengthen and hydrate dry, damaged hair. Free of Sulfates, Parabens, Harsh Salt Systems, Harmful Colors and Harmful Fragrances. The ORIBE Conditioner for beautiful color is a restorative conditioner for natural hair that has been specifically created to extend the overall life of hair dye being used and it also soothes over-processed and color-treated hair. This conditioner provides enhanced environmental protection, which protects your hair from the color-sapping UV rays. The ORIBE Conditioner for beautiful color contains natural ingredients like Watermelon, Lychee and Edelweiss Flower Extracts and they are an intrinsic part of Oribe Signature Complex. They defend your hair from any oxidative stress and photo-aging. Contains honey derived humectants that provide extra protection to hair from chemical dyes. Formulated without chemicals like sodium chloride or parabens. It is a little expensive for everyday use. The Carol's Daughter Monoi repairing hair mask is a clinically tested product with proven results and it has been created as a deep conditioner for natural hair that also works as a repairing treatment for hair. It works towards nourishing your hair right from the root all the way to the tip and thus reduces any unwanted damage in the near future. 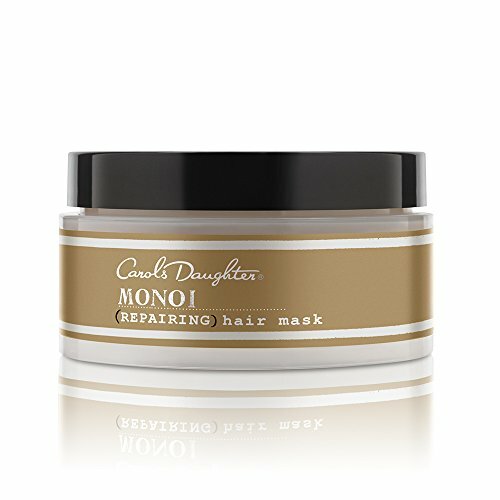 Carol's Daughter Monoi repairing hair mask contains natural ingredients including the rejuvenating Monoi Oil that provides noursihment to fine, fragile or chemically treated hair and strengthens it. Leaves your hair shiny and healthy while adding volume. If you have been looking for a best deep conditioner for natural hair that enables proper hydration of your scalp and hair then Moroccanoil intense hydrating mask is what you need to try. It is quite commonly known as the "five-minute hair mask" as it can quickly revive your hair. This hydrating mask has been infused with antioxidants and other natural hair nourishing ingredients. 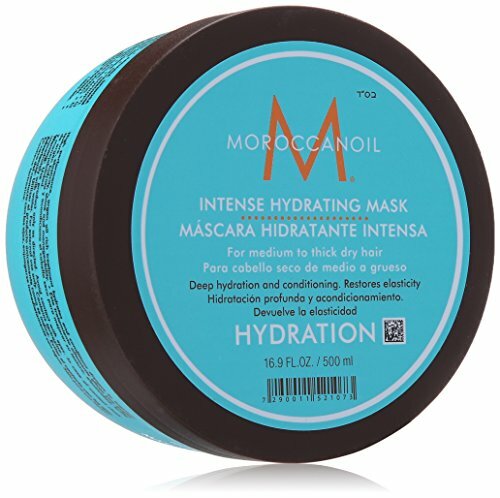 Moroccanoil Intense Hydrating Mask is a high-performance conditioner that has a rich and creamy texture and has been specially formulated for medium to thick and dry hair. Sometimes, the restoration can take more than 5-7 minutes as mentioned in the label. These are some of the best deep conditioners for natural hair and each one of them offers a host of benefits when it comes to replenishing of hair and maintaining styles. If you have been wondering where to start, then this is just the list that will provide you with a good option based on your specific needs, ingredients, and budget.